Stephen’s been writing technical documentation since the 80’s and recently published his novel STARS IN THE TEXAS SKY, a 2012 Amazon Breakthrough Novel Award quarter-finalist. He’s successfully marketed his books through all the methods listed above, and has sold in the low 100’s of printed books and somewhere north of 500 copies of his eBook. Be sure not to miss this opportunity to learn from his experience and talk with Stephen J. Matlock about your publication! 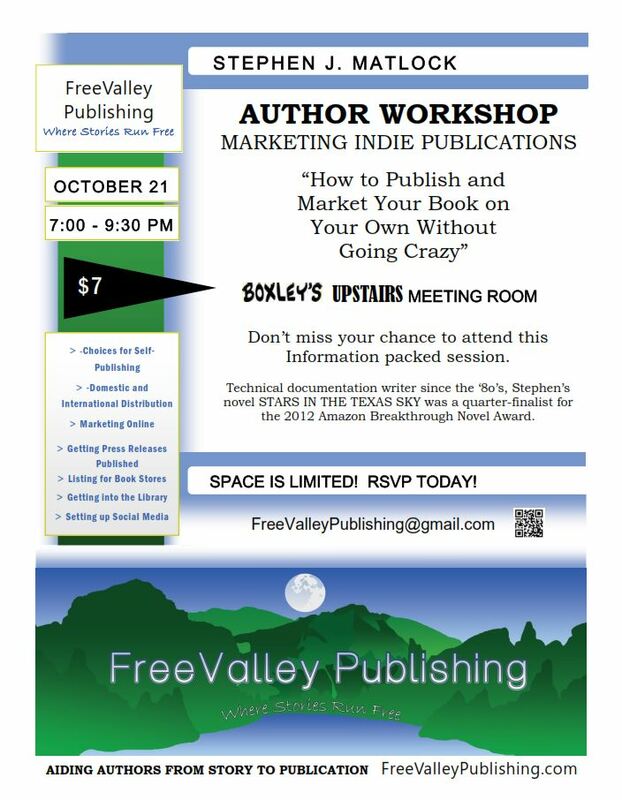 This entry was posted in Community, Events and tagged Amazon Breakthrough Novel Award, author workshop, book marketing, indie authors, publishing tips, Stephen J. Matlock by freevalleypublishing. Bookmark the permalink.